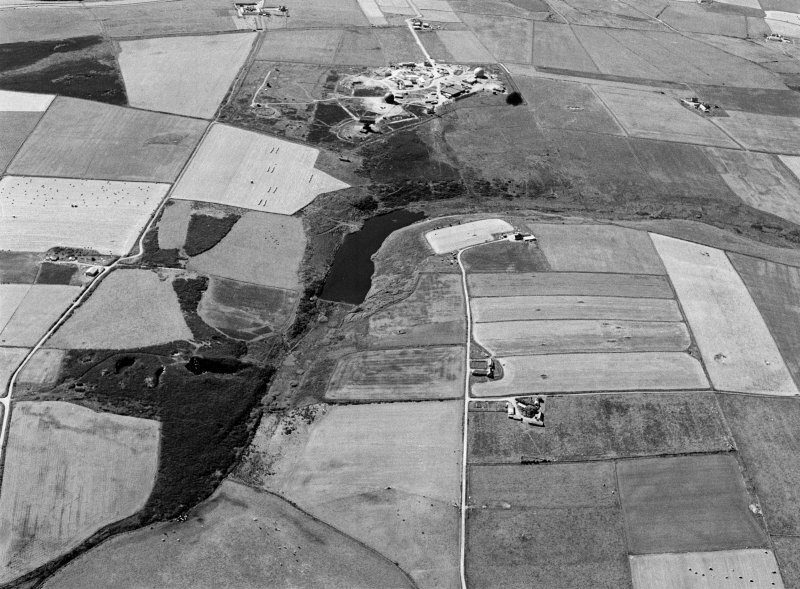 Oblique aerial view centred on the Den of Boddam reservoir, flint mines and lithic working site, looking to the NNE. 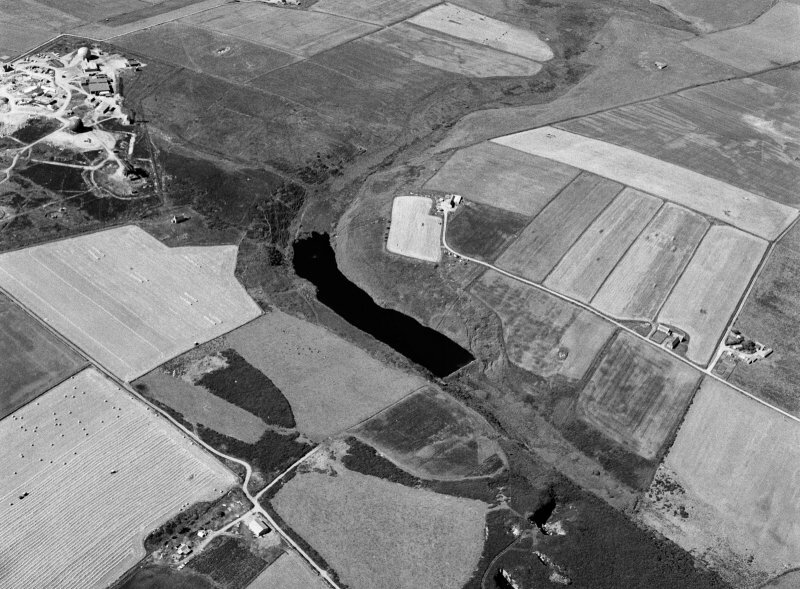 General oblique aerial view centred on Den of Boddam reservoir, flint mines and lithic working site, looking to the NE. 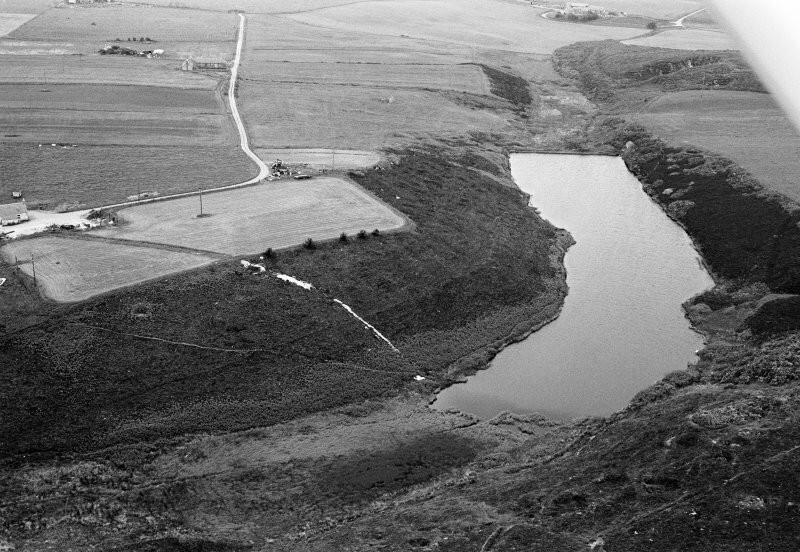 Oblique aerial view centred on the Den of Boddam reservoir, flint mines and lithic working site, looking to the WNW. 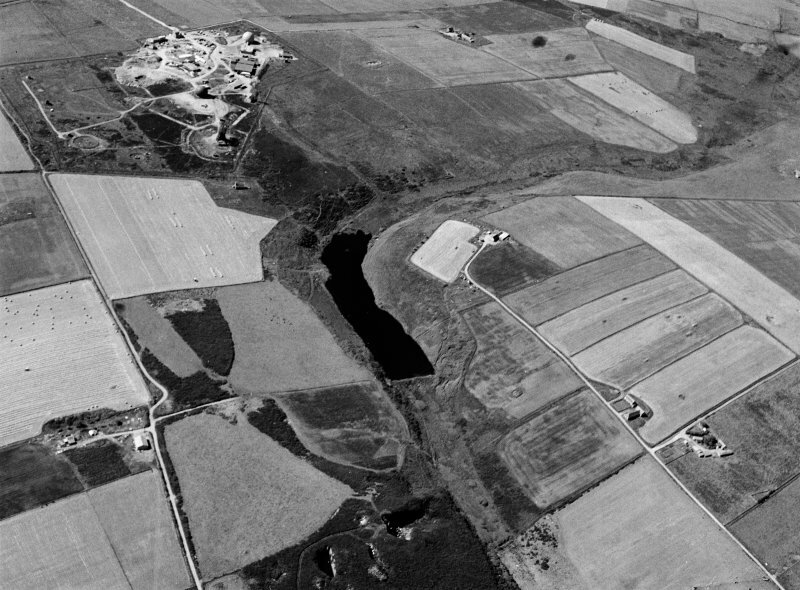 Oblique aerial view centred on the Den of Boddam reservoir, flint mines and lithic working site with RAF Buchan radar station adjacent, looking to the SSW. 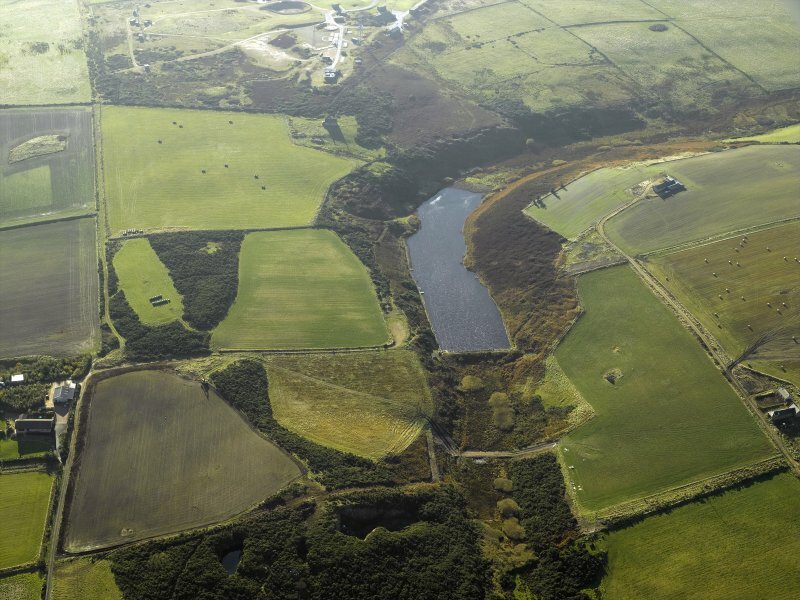 Oblique aerial view centred on the reservoir and the remains of the flint mines, taken from the SW.
Oblique aerial view centred on the Den of Boddam reservoir, flint mines and lithic working site with RAF Buchan radar station adjacent, looking to the WSW. 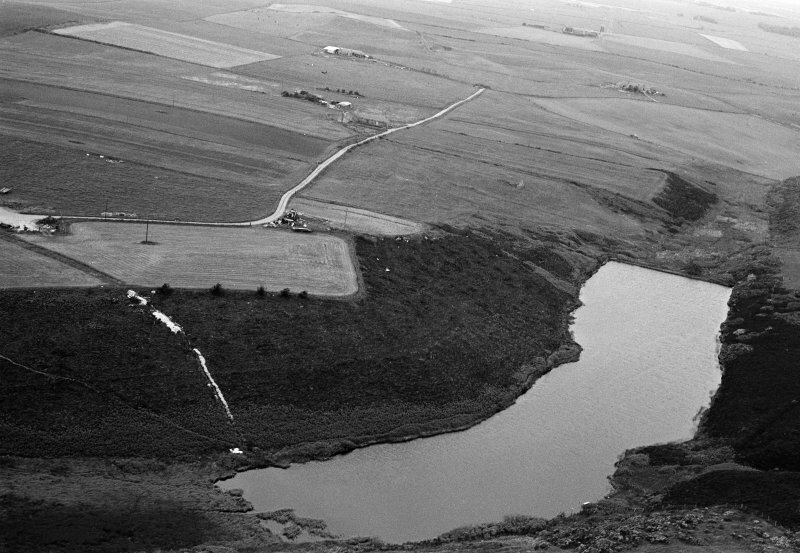 Oblique aerial view centred on the reservoir and the remains of the flint mines, taken from the NNE. 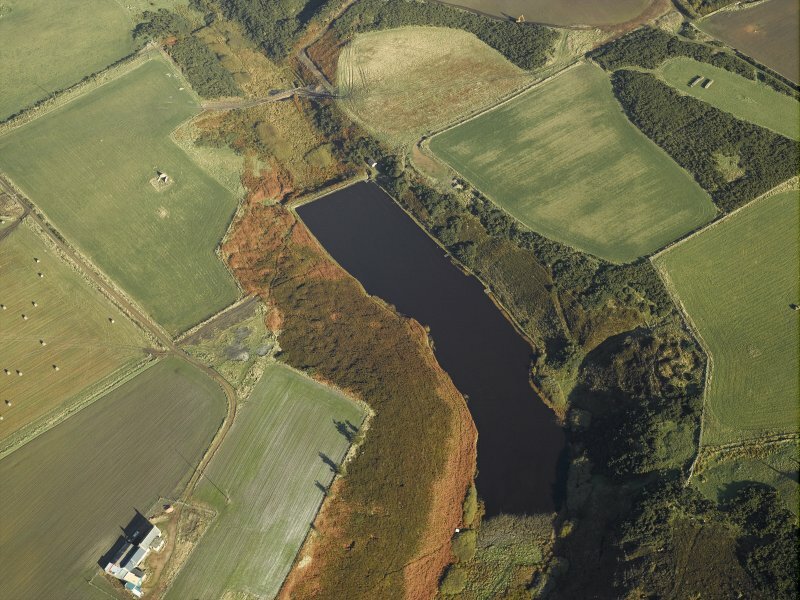 Oblique aerial view centred on the Den of Boddam reservoir, flint mines and lithic working site, looking to the NW. 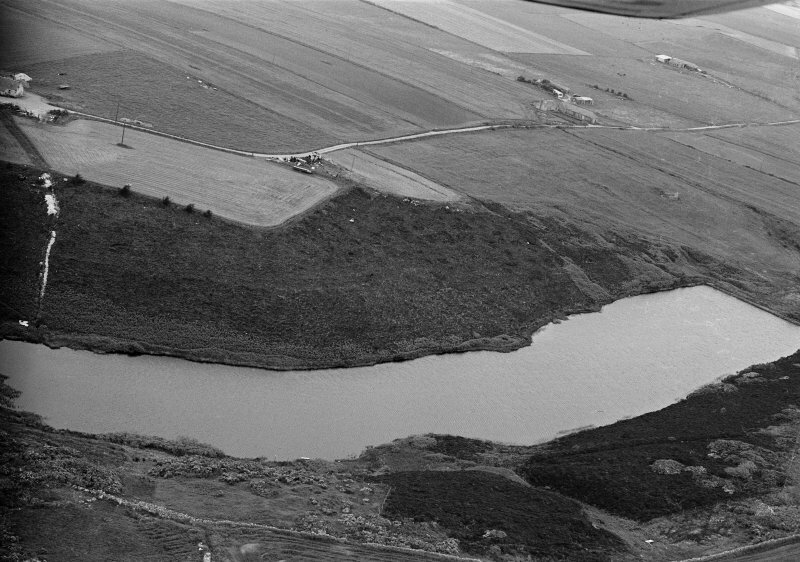 Exploratory excavations took place in May-June 1991 at NK 115 414, where extensive surface indications of flint extraction survive in the form of hollows on the steep slopes of the Den. The excavations confirmed the presence of substantial pits (over 2.5m deep) dug through glacial till into the underlying Buchan Ridge Gravel, and showed that pits continued beyond the Den slopes into cultivated ground. Spoil heaps from the extraction pits seal well-preserved buried soils. It is the Buchan Ridge Gravel which is the source of the large cobbles (up to 170mm across) of grey flint being exploited. The extraction area is densely littered with the residue of primary processing of these cobbles in the form of cores, flakes, and the quartzitic cobbles used as anvils. Secondary processing into implements appears to have taken place off-site. Further work will be necessary to clarify the precise methods of flint extraction and to elucidate the prehistoric chronology. Sponsors: National Museums of Scotland and Grampian Regional Council. NK 113 415. A second season of research excavation took place in July- August 1992, centred on a formerly cultivated plot above the W side of the Den. An area of c159 sq m immediately S of the modern ditch section examined in 1991 was machine-stripped, then cleaned by hand. The excavation focused on a close-set group of extraction pits on the S edge of this area. The western half of Pit 14, an oval pit c5.6m by 4.0m in plan at subsoil level, was completely excavated to its base at 4.1m below the modern surface. Pit 67 was only partially exposed in plan, but its W end was exacavated to the base at 4.4m below the surface. Both pits penetrate the Buchan Ridge Gravel for c3m. 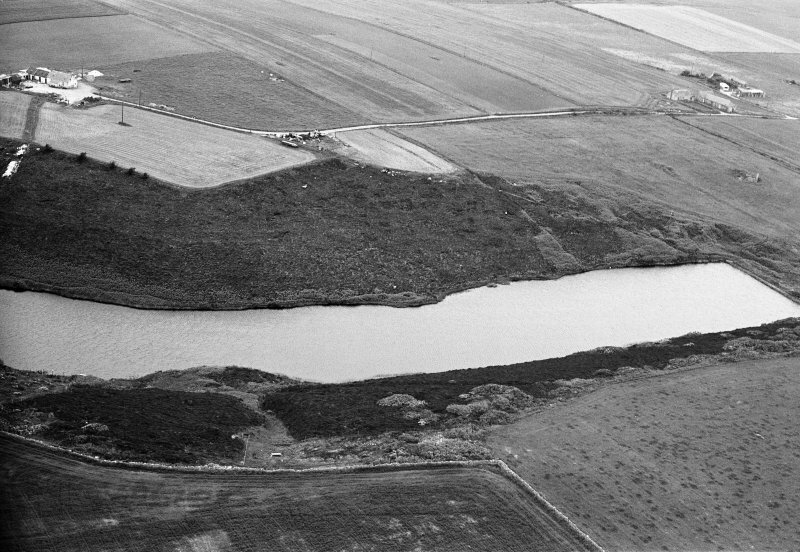 The lower fills of these pits were comprised of sterile backfill derived from the digging of other adjacent pits. The upper fill of Pit 67 was dominated by flint-knapping waste and abandoned quartzite anvils, and similar deposits were noted inn the upper fills of most of the pits in this area. To the N of the pits was an area where a buried soil was relatively well -preserved for c25 sq m. This was excavated in metre squares to recover a concentration of lithic knapping debris. An adjacent geological test-trench was dug to permit detailed recording recording of the fabric, orientation and clast lithology of the Buchan Ridge Gravel and the overlying glacial till. Archaeological and geological samples were taken from elsewhere in the Den to provide information on distribution and variability. It is now estimated that flint may have been extracted over as much as 4ha (10 acres), with pits being dug wherever the Buchan Ridge Gravel was close to the surface. no evidence for the manufacture of finished implements on site; virtually all the struck flint recovered is primary processing debris, often with a strong bipolar aspect, resulting from the technique of knapping on anvils. The Society of Antiquaries of London, The Prehistoric Society. 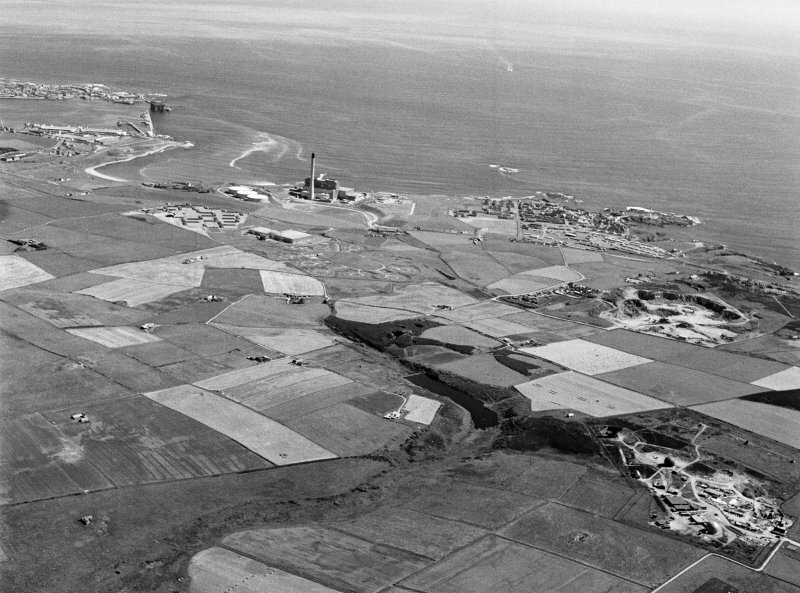 A detailed survey of the flint mines in the Den of Boddam was conducted over a period of a week in May 1993. The full extent of the flint mines was mapped at a scale of 1:2500, while a sample of the pits on the slope below the area excavated by Alan Saville were drawn at a scale of 1:500. Although the excavations have revealed complex sequences of pits cutting one another, the mines visible on the surface today appear to have migrated progressively further up the slope of the Den. Indeed, all the evidence gathered on the intensively exploited W side of the Den showed that the spoil dumps consistently overlay workings on their downslope sides. Visited by RCAHMS (SH) 10-14 May 1993. Following a survey of the Den by RCAHMS in May, a third season of research excavation in June-July examined an area of c. 130 sq. m. immediately SW of thw 1992 excavation. Machine-stripping revealed the presence of seven extraction pits, two of which - Pits 46 and 101 - were wholly within the cleared area and work was concentrated on these. Pit 46 was sub-circular in plan, with a diameter of c4m and a depth of 3m below the modern surface; Pit 101 was oval in shape, c5m by 4m, and 2.7m deep. Excavation has made it clear that the pits were originally bell-shaped, being much narrower at the surface when first dug. The present shapes result from collapse of the unstable upper edges which had been undercut when the lower flint-rich deposits were extracted. The pit floors were also irregular, the base of Pit 46 having a pronounced step on its SW side. A buried soil was well-preserved over the N sector of the excavation area, where it had been protected by surviving upcast, but proved to be archaeologically sterile. Field-walking on the NW side of the Den produced clear evidence for the limits of extraction beyond where pitting is visible at the surface, and has also helped document the variability in flint colour related to changes in the nature of the Buchan Ridge Gravel. Radiocarbon dated obtained from samples of the buried soil and from initial peat formation have indicated a late Neolithic (late 3rd millennium uncal BC) bracket for the flint extraction at Boddam. Sponsors: NMS, Grampian Regional Council.